Volume & Texture for your Hair - Website of seventyfourhairandbeauty1! For all those clients who are looking for added volume and texture this is the post for you. We will look at products that are some of SeventyFours favourites and how to use them. 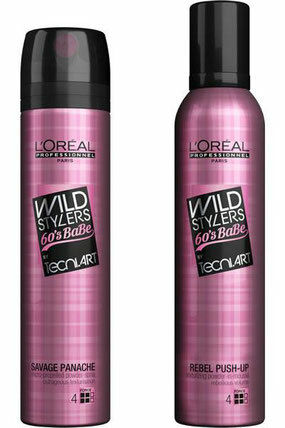 The first product is from L'Oreals Wild Stylers 60s Babe range. As you can probably tell from the name it is designed to help you build volume that would fit it well in the 1960's, creating looks like the Beehive, Flipped Bob and the Mop Top. Rebel Push Up is a mousse with firm hold. The difference from other mousse is the added powder element which gives additional texture and root lift. This product should be added when wet and blowdried using a large round brush to ensure maximum root lift. If you are anything like me this volume created can flatten overtime, the good thing about this product is that when you put your fingers back through the root it will lift again, recreating the volume. Savage Panache is one of my favourites and should be applied directly to the root after the hair has been dried. It gives additional root lift and creates a great base for hair ups when back combing the hair. Again this product, like Rebel Push Up, allows lift to be recreated throughout your evening out. 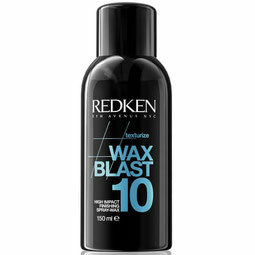 Redken have a fabulous product, a wax in spray form, Redken Wax Blast 10. This is a finishing product so should be used once you have dried and created your style. Just like other wax products it creates a texture and defines shape as well as having good hold. The good thing about this product, unlike other wax, is that it goes through he hair evenly with no stickiness. This product works really well on shorter, textured hair so would also work well for the gents out there.